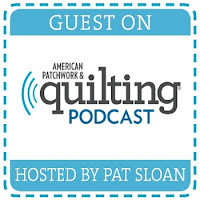 When I started quilting/sewing a couple of years ago (not quite 2 years on the sewing, a little over a year quilting), I didn't know what tools I would need. I actually did some sewing back in the 1980's (showing my age there), but I hadn't touched a sewing machine for years! I remember trying to cut some fabric with a pair of scissors and thinking, "How in the world am I going to get a straight line?!" So, I went searching the internet. Things have changed a little in 20-30 years - most people use a rotary cutter now! Okay - which one do I choose? Plus, I was going to need a cutting mat. I admit that I purchased one of the least expensive combos I could get. After all - who knew if I'd even keep up with this new hobby I'd started. The first thing that I received was a huge box that had the OLFA 24" x 36" Double-Sided, Self-Healing Rotary Mat. My original thought? This mat is huge! 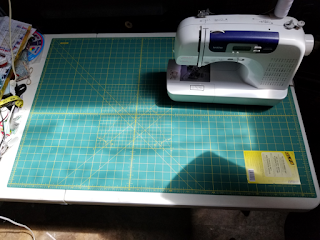 My sewing space consists of a 5' folding table that holds my cutting mat, my sewing machine, various tools, and sometimes my iron and portable pressing mat. As my space is kind of cramped, I was worried where I would put the mat. However, I ended up keeping my sewing machine on it - there is still a ton of room for cutting. The next thing I noticed was that when I made cuts using my rotary cutter, the cut marks didn't show on the mat. I have been using it for two months now and still no marks on the mat. It's much more flexible than my other mat. I really didn't think that there would be much of a difference; after all, a mat is a mat - or at least so I thought. I was wrong. The Olfa cutting mat is great. 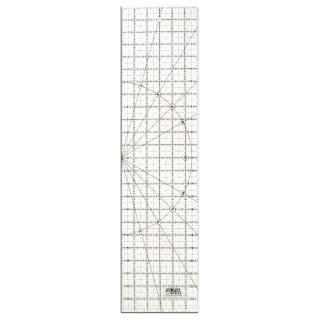 With the mat, Olfa sent the 6″ x 24″ Frosted Acrylic Ruler. I already had a 6 x 24 ruler, so I wasn't very excited about. Again - I was proven wrong. I was worried that the "frosting" on the ruler would be cloudy - not at all. I can see perfectly through it. And, it doesn't slip around. The frosted surface is non-slip. For the first time since I'd been sewing/quilting, my ruler didn't slip when I cut my fabric. I love it. I can't wait to get more rulers in other sizes. 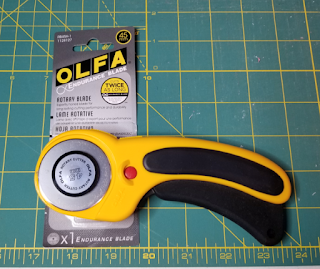 Finally, Olfa also sent me a rotary cutter and a couple of blades (see the picture at the top of the post). I received the 45mm Ergonomic Deluxe Handle Rotary Cutter, a 45mm Endurance Rotary Blade, and a Stainless Steel Pinking Blade. I was really excited to try the rotary cutter as it has an ergonomic handle. When I am cutting a lot of fabric, my wrist and arm usually end up hurting. I found with this rotary cutter, that didn't happen, even though you need to squeeze the handle when you cut. It sliced right through fabric and, when I was done, the blade automatically retracts. That means no accidentally cutting yourself when the cutter is just laying out! (Yes, I've been the victim of many accidental cuts....) My sister tried the rotary cutter, too. She wasn't thrilled with it right away. Her comment was that it will take a little bit to get used to. However, she loves it now (she said that she got through the learning curve really quickly)! I haven't had an opportunity to use the pinking blade, but I had to change the blade on the rotary cutter (after 2 months of use), so I decided to try the endurance rotary blade. Oh my goodness - I don't think that I'll go back to a regular blade. I could tell a huge difference on the very first cut. Effortless. I have read on various social media posts that some people don't see a difference with the endurance blade. I did - right off the bat. I love it! As you can tell from my review, I really do like the Olfa products. It made me realize that while these products might cost a little extra up front (and the price difference really isn't that different), it is definitely worth it - especially when you consider your time and the quality of your finished product. If you end up with more precise cuts, isn't it worth it? While Olfa sent me these products to review, all opinions are mine. Honestly though, I am a definite Olfa fan from here on out. Thank you, Olfa for sending these products and for allowing me to give some away on my blog. 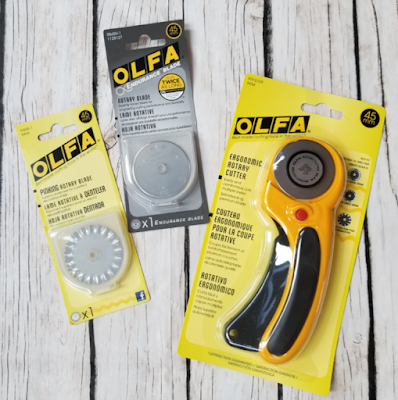 Olfa has generously offered to give away three prizes: Ergonomic Handle (1 winner) and 45mm Endurance Blade (2 winners). That's three opportunities for you to win! What do you need to do? Enter using the Rafflecopter form below. Also - there are more opportunities on my Instagram page. You have until midnight eastern, Sunday June 24, to enter. Entries from both methods will be combined and winners will be posted on Tuesday, June 26. Good luck! a Rafflecopter giveaway Rules: the winner must be 18 yrs of age or older and live in the US or Canada. Not affiliated with Facebook, Instagram, or any other social media entity. While I have been given these items for review, all opinions are mine. Until next time - blessings & peace - and happy crafting! Make sure you follow me on Instagram, on Facebook, and subscribe to emails so that you can stay updated! I have not had the opportunity to try the endurance blade, yet, but I would love to try! I haven't had a chance to use the Olda endurance blade yet, but it sounds wonderful! I have this cutter but havent tried the endurance blades. Also used their mats. Super easy to cut and store. I would love to try the endurance blade. I have not used the endurance blade but I would like to try it. I have not used the endurance blade, but I do use Olfa products. I haven't had a chance to use the endurance blade but would love to try it. I have not used the Olfa Endurance blade yet but certainly would love to try one. No, I have not had the Opportunity to use the Olfa Endurance Blade as of yet. However I am absolutely willing to give it a try. I am currently searching for something that is Rheumatoid Arthritis friendly. I have severe R.A. and my hands are very sensitive. I am always in pain. So I am very interested in the Olfa rotary and the Endurance Blade. 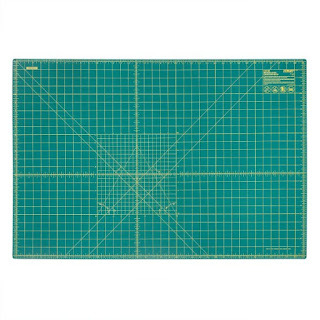 I do have a new Olfa Rotation cutting mat, and O'Lipfa Lip Edge ruler I bought at an estate sale for $1.00. I have not used the Olfa Endurance Blade. I have 3 Olfa rotary cutters and my husband has one so unless one of our cutters breaks down, I can't be thinking about buying another one, even though an Endurance Blade would be great to have. I love olfa rotary cutter but haven’t tried the endurance blades yet. Will need to try them and also will need to try their rulers. The endurance blades sound amazing! I love my Olfa rotary cutter but I have not tried the Endurance blade.